Once we left the city, the four hour drive to Mui Ne took us through some very pretty scenery. Mui Ne is a coastal resort town popular with surfers and wind surfers between August and December when it's windy. The hotels, restaurants and shops are located on a main road stretching for about five miles. May is an off season month popular with Russian tourists looking for an inexpensive holiday in the sun. The better restaurants were empty and the low end restaurants catered to Russians with signage and menus in Russian. We stayed two nights which was just long enough to enjoy the beautiful beach and visit the red sand dunes and the small fishing village that was Mui Ne before the resorts were built. Our hotel, The Allez Boo Resort . This photo was taken from the restaurant showing part of the pool and the beach. After leaving Mui Ne, we headed into the mountains to Dalat a hill station built during French colonial times and now a popular honeymoon resort. We toured the Summer Palace of King Bao Bai who was the last King of Vietnam. Very Art Deco! 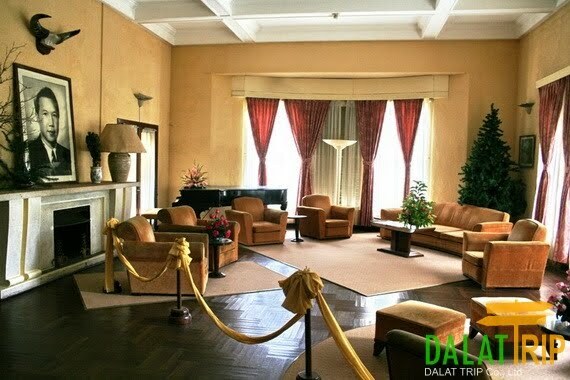 The summer Palace was built in 1937 and for the most part was used as a private residence.